It is late in the growing season. Many plants (and gardeners including myself) are running out of speed and ambition. I have heard a few say that they are tired of what has been blooming all summer and they are ready for a change or ready for the cold weather to hit. This growing season may be coming to a close, but I can assure you that many weeds are still happily growing. Remain diligent in your weed control efforts. With the cooler temperatures we had recently, came a new flush of cool-season weeds. I am seeing a fair amount of common chickweed and henbit seedlings. Additionally, I am seeing quite a bit of dandelion growth, with much of it being seedlings. This time of year is also when the summer annuals such as prostrate spurge, common purslane, and prostate knotweed reach maturity and become quite noticeable in the landscape. The days are getting shorter which affects the amount of time we are able to spend gardening. You may be weary of battling weeds, but I encourage you to keep up the good fight. Do NOT let these weeds remain onsite. They have likely flowered or produced seed. Take the time to remove them carefully to prevent further seed dissemination. You may recall the old saying, "One year's seeding makes seven years' weeding." I don't know who the poor misguided soul was who penned this, but I can tell you that it is a lot longer than seven. 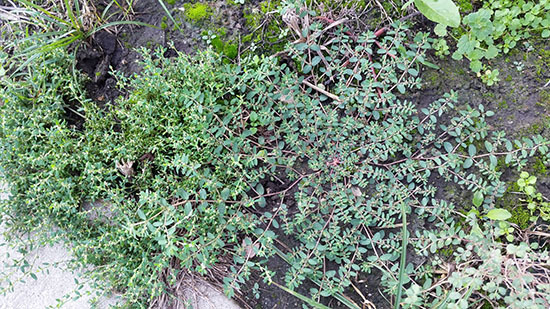 Prostrate spurge and prostrate knotweed in flower next to common chickweed and henbit seedlings. According to Michigan State University Extension Bulletin E-2931, 'Integrated Weed Management "One Year's Seeding...", seeds of various weed species persist in the soil for different lengths of time. Once weed seeds are produced and dispersed, they can either germinate and emerge, germinate and die, lie dormant, become non-viable, decay, be eaten, or be removed by wind and water. The problem of course for us is the seeds that lie dormant. For those, germination could occur the following year or many years from now. Research has been done on many common weed species to determine their persistence in the soil seedbank. The years required for a 99% reduction in seed number is fairly small for giant ragweed and common sunflower at only two years. However, velvetleaf and common lambsquarters seeds take much longer to see this same reduction at 56 and 78 years, respectively. Even a 50% reduction for common lambsquarters would still take 12 years. And we aren't talking about a few seeds either. These species are abundant producers of seed. One common lambsquarters plant can produce 72,500, while one velvetleaf can produce 7,800. 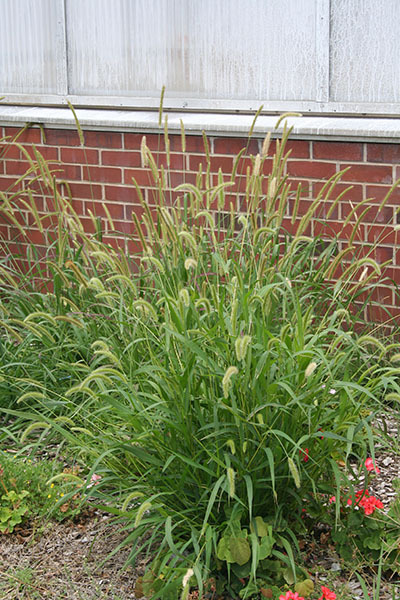 This foxtail has been allowed to grow in a landscape bed and produce thousands of long-lived seed. So, if we let down our guard in the garden to head inside for pumpkin spice anything, and a single velvetleaf plant goes to seed, we can be left with a whopping 3,900 seeds in the soil 12 years down the road, and we can still be battling the offspring of that plant 50 years later.